Webasto Petemar, the Polish subsidiary of worldwide operating marine and automotive supplier Webasto, was selected to supply the 40 m superyacht Viatoris with a customized climate solution to create the ideal ambient temperature aboard. For the Viatoris, Webasto Petemar chose the BlueCool P-Series which has a cooling capacity of 448,000 BTU/h. 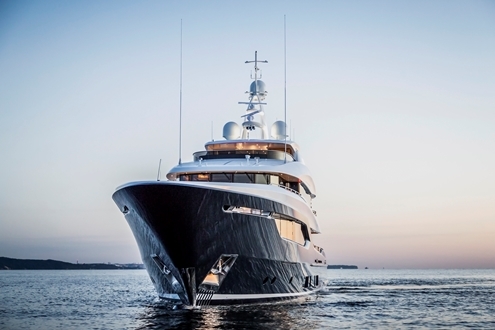 This professional chiller system for superyachts is highly customizable to meet the demands of shipyards and national classification societies. The system distributes conditioned air to all four decks of the superyacht and removes used air by means of fresh-air and extract-air modules. Air-conditioning systems are crucial when it comes to coziness and well-being on board a superyacht. When it is hot outside, passengers can relax in the cool interior, as needed. However, when the weather turns cold, the system provides pleasant interior temperatures so that passengers can feel comfortably warm and at ease. The challenge facing a climate-solution provider like Webasto Petemar is to install the airconditioning system so that it goes unnoticed and to minimize the space requirements needed to integrate the system. To find the perfect climate solution for this superyacht, Webasto Petemar was involved at all stages of design work as well as during the construction process. The project kicked off in August 2015. In November 2016, the Webasto chiller system was delivered and the superyacht was finally launched in May 2018. In September 2018, graceful and luxurious Viatoris made her debut at the Monaco Yacht Show. This 40-metre flagship, built by Conrad Shipyard, is the largest motor yacht ever made in Poland.